Turns out Chapsmackers is a highly addictive jar of pickled jalapenos. Greg Hellinghausen of Belton, Texas was raised on hot peppers and cold beer in the West Texas oil fields. He and his brother spent years searching for the perfect pickled jalapeno recipe and never really loved what they found. Like their mama used to say, 'You can put your boots in the oven, but that don't make them biscuits.' Greg decided to take the best of about a dozen old Texas recipes to come up with his own version. Beckie was instrumental in branding Chapsmackers through her first ad agency. Beckie, "The Hausen'Pepper Trading Company approached us about naming, branding and packaging their father Greg's pickled jalapeno recipe to take to market. The product was so amazing that people would literally follow their father around Texas trying to buy as many bottles as they could. By the time we were asked to work with the product, it was a huge hit." Beckie, "After meeting Greg personally and tasting his product, the naming and branding process just came naturally. Chapsmackers was the perfect name and the cowboy we custom created for the label was meant to embody Greg and all his awesomeness. He is a Texas cowboy through and through." Greg Hellinghausen has been making these peppers for over 25 years now. While most pickled jalapenos are soaked in brine first, his are not. Instead they are pickled immediately in vinegar, oil and spaces so you really capture the taste and texture of the pepper. Made in small batches with heaps of onion, carrots and garlic, their high quality and flavor stays intact. 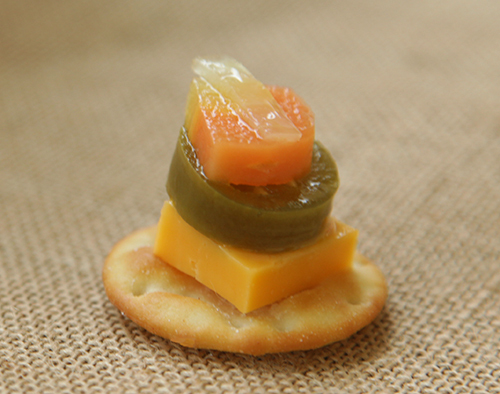 Beckie sent a jar in the mail to me and instructed that I put the jalapeno on a cracker with cheddar cheese. I did that and it was good. Then I grabbed another and liked it even more. Needless to say, it stayed in my fridge less than 48 hours before I, and only I, devoured the entire contents of the jar. These peppers taste amazing and have been known to light a tasty fire in creamed spinach and smoked salmon too...plus, the pickled juice makes a killer Bloody Mary. So happy I found Beckie, a new friend in my life and now Chapsmackers, till death do us part.